My sister’s dog, Summit, came to stay with us for the weekend. She’s a good dog, but old, and needing that extra assistance that older dog need. Misha and Summit aren’t crazy about other dogs. They tend to be a little nervous when other dogs are around. Though both were introduced to dogs early on, they never were into playing or wrestling with other dogs. I have done some reading on dog behavior. Brian Kilcommons’ “Good Owners, Great Dogs” is my go to book. I bought a copy when I got Sierra and it proved to be a common sense guide to have around. I still have it on my shelf. Maybe I should read it again. Despite being dogs that don’t like to be around dogs, they get along fine. How do they do it? They completely ignore each other. Well, I shouldn’t say completely. Periodically, Misha steals Summits treats because she is too slow to pick them up. In return, Summit blocks Misha from coming through the back sliding door, then chases her at full speed down the hallway. But, for the most part there is no interaction. 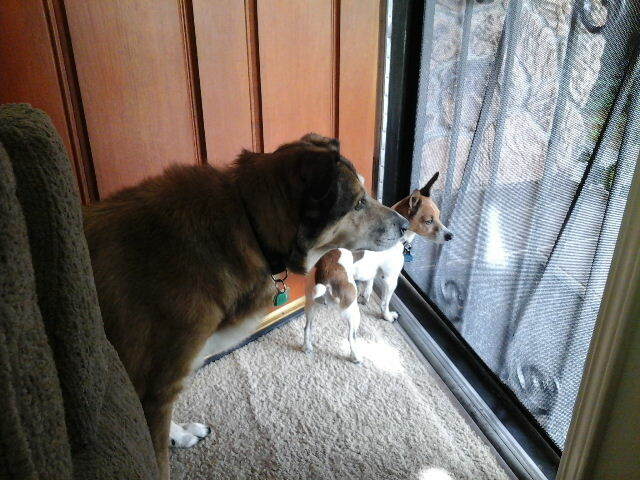 When the two dogs first met, Misha was about 10 weeks old and Summit was 6 or 7. For 6 months, Summit ignore Misha. She would not look at her. She stared at the wall to avoid eye contact. Eventually, she acknowledged her presence. There was a little bit of tension as they learned to be around each other, but within a year, they settled into their current relationship. So, for 3 days, Summit sat at the front door waiting for her parents. Misha laid in her bed covered in her blanket. When food was around, they both waited for their treats. Then, they went back to what they were doing. 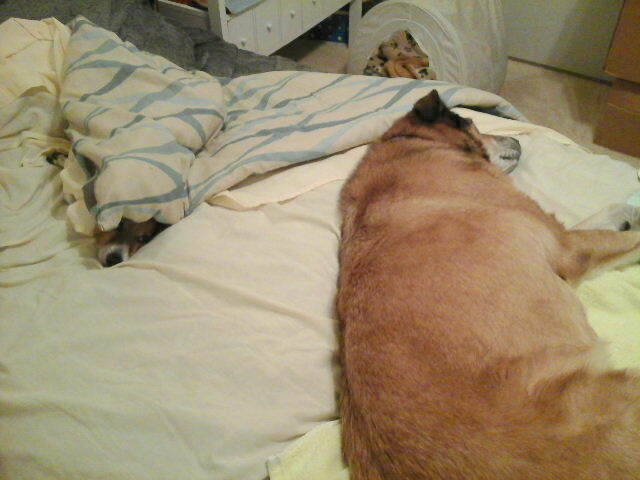 The dogs manage to rest together. Can you find Misha? It would have been nice if they enjoyed each other more. But, at least they don’t fight. I guess a good behavioralist could figure this out. But, I’m not a behavioralist. Dogs can be difficult to figure out. “Decoding Your Dog” has some interesting ways to approach behavioral problems. I didn’t see anything it in for our unique situation. Perhaps that’s because they don’t see two dogs getting along but ignoring each other as a problem. Summit went home Sunday night. Both dogs are exhausted. Misha slept most of Monday. I guess deliberate avoidance takes up a lot of energy. You’d think they spent the whole time rough housing.